Knit By God's Hand: Really Lost? Do you know its been off for 5 years now & I STILL have the finale on my DVR. I just can't make myself get rid of it. Seriously though - like I could just watch the finale down the road & even understand most of it. I could hardly understand week to week what was happening - but loved every second of it. 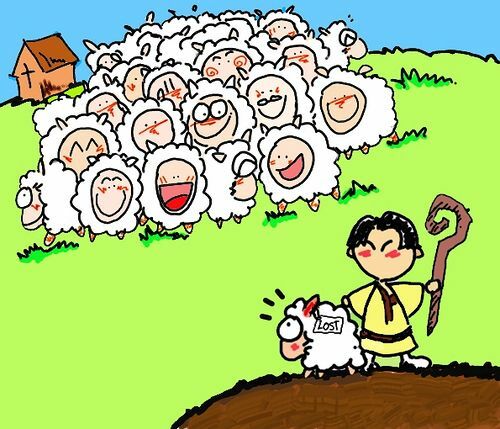 The word LOST has been in my head for the past 2 weeks because I just did a message to the youth kiddos about the parable of the Lost Sheep. You know the one... a man has 100 sheep. One goes away & the man leaves the other 99 to go find the one. Was the sheep really lost? I had the instant idea in my heart about a child running down the aisle of a toy store so excited to see what the latest thing on the shelf is, dodging past everyone to get their hands on something they can immediately ask if they can have... & turn around & they don't see their parent anymore in the crowd. ... but the parent sees their child. The child just can't see their parent. That child feels lost. Scared. Alone. Panic. .... but the parent makes their way through the crowd to let them know they are there. I'm sure that one sheep that felt got away from the other 99 felt lost. Scared. Alone. Panic of what may get him out in the wilderness.... but I just had this image of the Shepherd standing on top of a hill, watching him, knowing exactly where he was all the while. I think when we feel lost in life - feeling like we're in this thing alone, that nothing is going right, when it feels like we're on the wrong path & can't find anything around us that feels safe, it isn't that our Father has just let go of our hand & lost us... we wandered off.. & its up to us to notice we've wandered off. That we went the wrong direction. That we strayed from the safe secure places. "I was the wandering one....."
Love this! Also, I still haven't watched Lost. I hear a lot of people hated the ending but is it still worth it to watch the whole show? I can't believe you still have the finale in your DVR. I loved that show! Love your analogyon the lost sheep. Thank you for the reminder. What a great video! I had friends who have talked about Nick before but I have never looked him up! goodness...this is so true and speaks to the way I've been feeling recently. Thanks for sharing!